Here's some great news for Houdini buffs in the UK who have been wondering how they are going to see the Houdini miniseries, which premiers tomorrow in the U.S. Phil Treece from the UK tips me off that Part 1 will air next Sunday, September 7, on Channel 4. You can get more details at the Channel 4 website. Also, the UK DVD is currently available for pre-order on Amazon.co.uk. The release date shows as October 6 (a day before the U.S. release). I'm not sure whether this will be the extended edition. 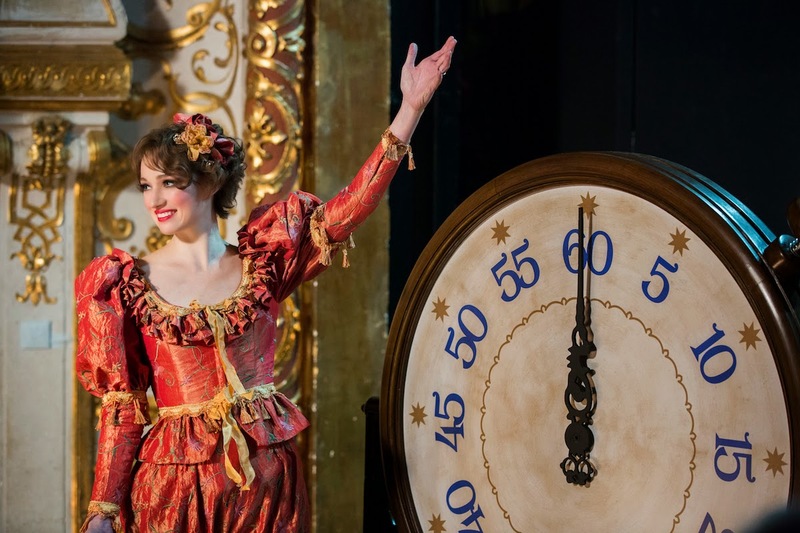 We are now just 24 hours away from HISTORY's Houdini miniseries starring Adrien Brody and Kristen Connolly. Part one airs tomorrow, September 1 at 9/8c. Part two airs on Tuesday, September 2. It will then be available as an HD download on September 3 and on DVD and Blu-ray October 7. Reviews are already starting to appear and some already have the knives out. I've been lucky enough to see the entire miniseries, but I've chosen not to voice my opinion until after it airs. I want people to come to this as fresh as possible and have their own experience. However, I will be posting "Fact Checks" of each night immediately after each episode airs. I think this is important so general viewers have a way to find out if what they just watched was fact or Hollywood fiction. I will then post my full review on Wednesday and share all the thoughts that I've been formulating for the past few weeks. A major biopic like this is a pretty big event in the Houdini world, and one that only comes around once in a decade at best. So no matter what you think about HISTORY's Houdini, I think we can all agree that it's been a lot of fun getting here. Last night I got a hot tip from Joe Fox that there was a Houdini billboard at 3655 Cahuenga Blvd above Miceli's restaurant in Universal City. I jumped in my car and grabbed these shots as the sun was going down. This is my first sighting of a Houdini billboard in L.A. Fittingly, it's on the road to the Magic Castle in Hollywood. 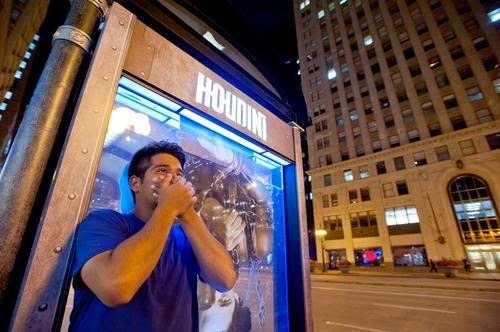 I'm actually surprised that I haven't seen more Houdini billboard and bus stop ads like this. When HISTORY aired Bonnie and Clyde, I saw street ads everywhere. But I guess when you have stars like Adrien Brody and Kristen Connolly, the amount of free media (interviews, etc) is what you count on instead of street advertising. 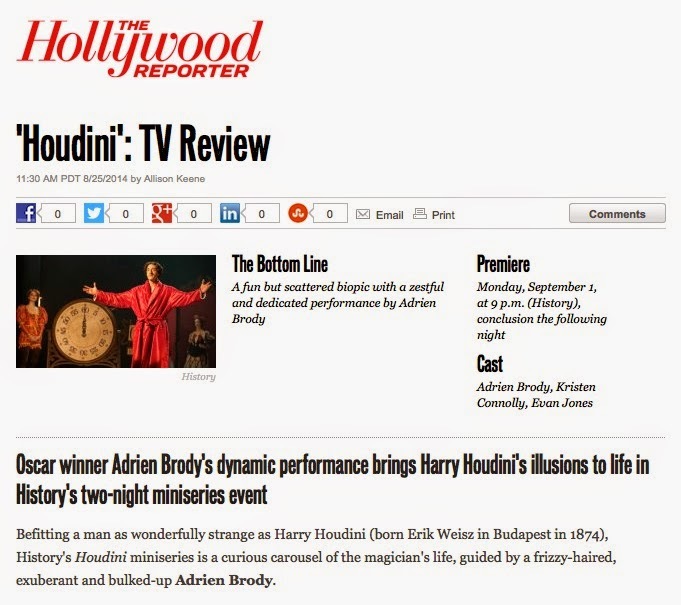 It's certainly been the case that Houdini has received a lot of attention in the press. Houdini airs Monday and Tuesday at 8/9c. 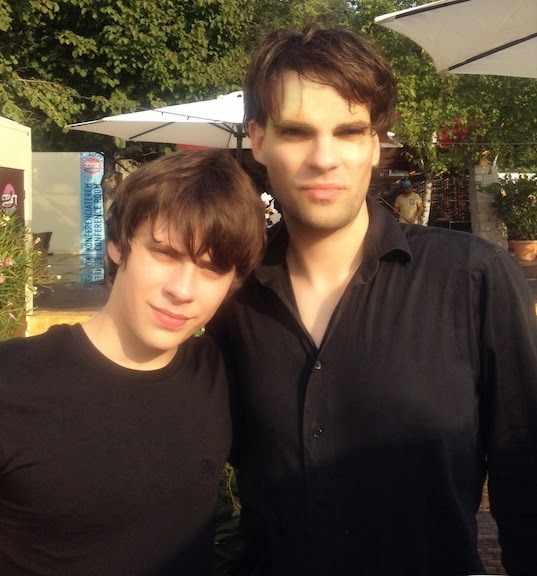 Jake Bugg and David Merlini. The Houdini miniseries has its first breakout star. After the full trailer was released earlier this month, by far the most asked question on YouTube and elsewhere was, "Who did that song?" The answer is Jake Bugg, a 20-year-old British singer songwriter, and the song is called "Simple Pleasures" from his second album, Shangri La. The song can also be purchased as a MP3 single on Amazon. Above is a photo of Bugg with Houdini's technical advisor David Merlini at a recent music festival in Budapest (where the Houdini miniseries was filmed). 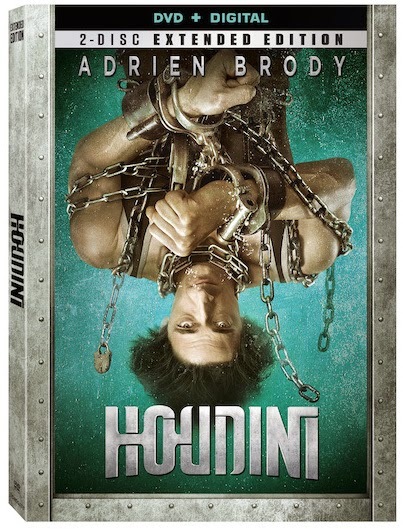 Keep your ears peeled on Monday and you'll hear Adrien Brody's Houdini give David a namecheck. 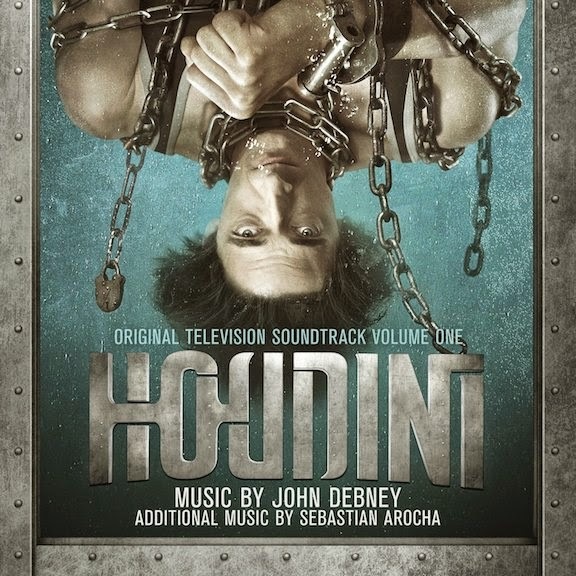 Speaking of music from Houdini, John Debney's soundtrack is available now for purchase as digital download. It will be released on two CDs on September 25. Houdini premieres tomorrow at 9/8c on HISTORY. Q. Did you jump into research on Bess Houdini when you signed on to the movie? "I did. I'm really, really lucky, because what I started doing was just ordering these biographies, and they're like 600 pages long each. I was sort of slogging through slowly. But I have a dear friend, Michael Mitnick, who is a writer and a huge Houdini fan. He knows an incredible amount about the Houdinis. I've learned that there are a lot of people who are sort of obsessed with the Houdinis and know a lot about them. Michael put me in touch with a man named Tom Interval, who is a magician based in California, and he is a Houdini expert. He put together this packet of information: all the most important things that you could find, extracted from all of these different sources. I can't even tell you how helpful it was. It was like 30 or 40 pages of material about Bess as a person: how she grew up, anecdotes that people told about her, her relationship with Harry, all kinds of things that were just unbelievably useful to me. I certainly could not have done all of that work in the time that I had without him." "I learned how to do something cool with cards. Tom Interval gave me all the information on that. He taught me one cool way to shuffle cards that looks fancy on film. I don't even know if it made it into the movie… Adrien really carried the bulk of the magic." Kristen Connolly with Tom Interval and myself at The Magic Castle. "One of the sources was John Cox, who has a blog called “Wild About Harry” that I hope people will go to and check out, after they see the movie. If anyone is interested in learning anything about Houdini, it’s a wealth of information that you won’t find in a book." "There's much less written about Bess than there is about Harry. But if you are so inclined, you can really dig and find it. I learned an enormous amount from [John]. He was able to tell me what was really substantiated, what was a bit controversial, what some people said but it's probably not true." A very big thank you to Kristen for the kind words, and congrats to Tom for helping her find her inner Bess. 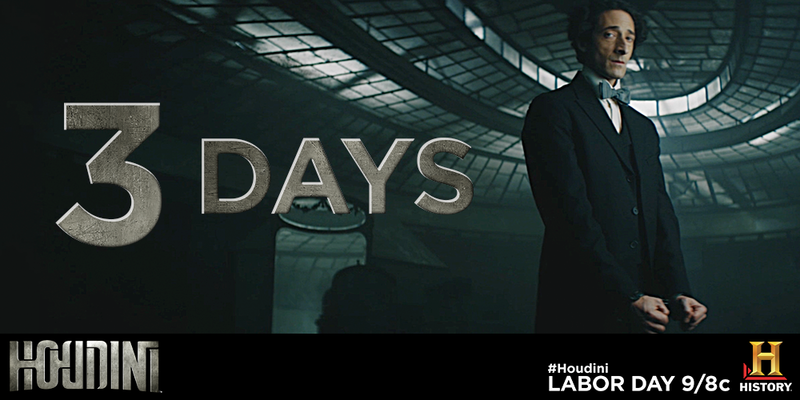 Houdini premieres Monday at 9/8c on HISTORY. HISTORY has offered up a 4 minute "sneak peek" of their Houdini miniseries set to premiere this Monday at 9/8c. The preview shows the first major scene of the miniseries when Harry discovers his challenge handcuff act...in a brothel. 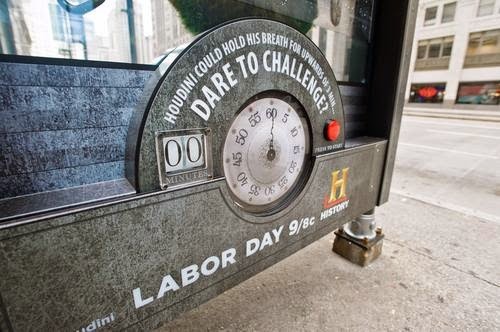 Houdini airs September 1 & 2 at 9/8c on HISTORY. It will be available as an HD download on all digital platforms September 3. An extended version will be released on DVD and Blu-ray October 7. In the run-up to Monday's premiere of HISTORY's Houdini miniseries starring Adrien Brody, the network will be repeating several past Houdini programs throughout this Labor Day weekend. On tap is the excellent Houdini documentary, Houdini: Unlocking the Mystery; the episode of Pawn Stars featuring Houdini Handcuffs; and the infamous "Houdini Murdered?" episode of Brad Meltzer's Decoded. CLICK HERE for the full programing schedule for HISTORY and H2. You can also see all the showtimes for the Houdini miniseries at HISTORY's official Houdini page. WILD ABOUT HARRY has now crossed over two million pageviews since we first went live on November 10, 2010. How fitting that we reached this milestone right on the eve of the Houdini miniseries. 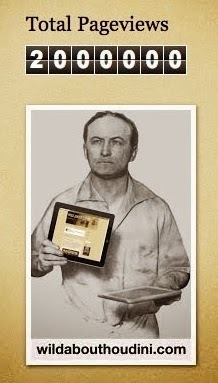 Thanks to everyone for visiting and supporting this blog and for keeping Houdini's legacy alive and thriving online. Harry's world has never been so WILD! 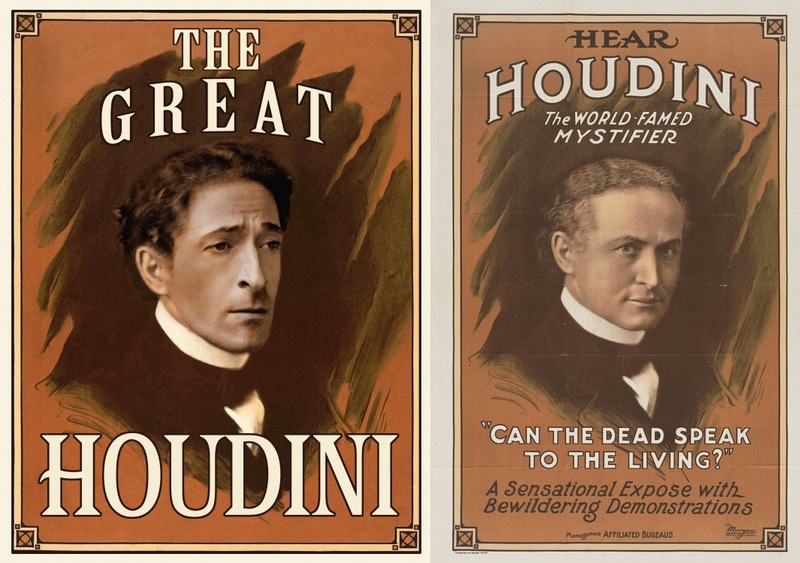 Here are four poster mock-ups created for HISTORY's upcoming Houdini miniseries. These are based on real Houdini posters and have been revamped with the faces of actors Adrien Brody and Kristen Connolly. Normally these kinds of things are only visible in the background, so I'm excited that A+E Networks is giving us a nice closeup look at them. Fun fun, I've placed them side by side with the originals. You'll want to keep your eyes peeled for more poster mock-ups when watching the miniseries on Monday, including Brodyized versions of Houdini's Amsterdam jail break, Europe's Eclipsing Sensation, and America's Sensation posters. A very big thanks to Monica Gonzalez of A+E Networks who has been extremely helpful and generous in providing WILD ABOUT HARRY with all this great 'Houdini' promotional material. A new paperback edition of Eric Kimmel's loose biography of Houdini's early life, A Spotlight For Harry, has been re-released with new cover art and four extra pages in the back about the real Harry Houdini. The book is aimed at readers aged 7-10 and includes nice illustrations by Jim Madsen. Harry Weiss—later known as Harry Houdini—is enthralled when the circus comes to his Wisconsin town. He loves all the acts, but his favorites are the tightrope and the amazing trick where a man hangs from a rope by his teeth! Harry and his brother decide to try circus tricks in a nearby barn, and although Harry’s headstrong determination leads him into trouble, it also opens up a whole new world. In this evocative story, Eric A. Kimmel tells how Harry Weiss discovered his love for performing, many years before he became world famous. A Spotlight For Harry was first released in 2009 in hardcover and paperback. You can purchase this new paperback edition from Amazon.com. Legendary and iconic figures of the twentieth century, the famous and the infamous, come to life on film in this fascinating collection of short subjects. A few of the many highlights include a look at the life of Theodore Roosevelt, as he evolves from warrior to conservationist. Master of Magic Harry Houdini performs one of his daring escapes while suspended high above the Manhattan streets. Sergeant York, the greatest American hero of World War I, is interviewed in 1919. Famed evangelist Aimee Semple MacPherson, credited with curing thousands with her faith healing, discusses her impending marriage. Clarence Darrow and William Jennings Bryan square off at the Scopes Monkey Trial in 1925. Ziegfield comedy queen Fanny Brice celebrates two decades in show business. Sherlock Holmes' creator Sir Arthur Conan Doyle visits New York. After escaping 17 trials without a conviction, notorious mobster Jack "Legs" Diamond is gunned down by a rival gang in an Albany rooming house in 1930. Mahatma Gandhi struggles to free India from the yoke of Great Britain. Personalities of the Past is a collection of narrated newsreel shorts probably from the 1930s. The Houdini clip, which is the second segment on the disc, is narrated by Roger Owens and shows Houdini doing a suspended straitjacket escape (but not in Manhattan as described). The footage we've seen before and the quality is awful, but Owens narration makes it unique and it's a nice product of its time. Also, the end includes the quick clip of Houdini demonstrating his thumb racket. Personalities of the Past runs 1 hour and can be purchased at Oldies.com or Amazon. Nevertheless, I like that David has uncovered some of the history behind Meyer's psychological conclusions and the connections he makes to Maurice Zolotow's fictional "Houdini" biography, The Great Balsamo. I've always been intrigued by Zolotow and his fixation on Houdini's personal life. He might have influenced Melville Shavelson's The Great Houdinis and it's "love triangle" between Harry, Mama and Bess. In fact, there's a whole weird Hollywood-Zolotow-Houdini thing that's been going on for years. Anyway, check out David's post at The Houdini File. I realize this week and next will be dominated by news of HISTORY's Houdini miniseries, but I feel like I need something real today, and this is as real as it gets. 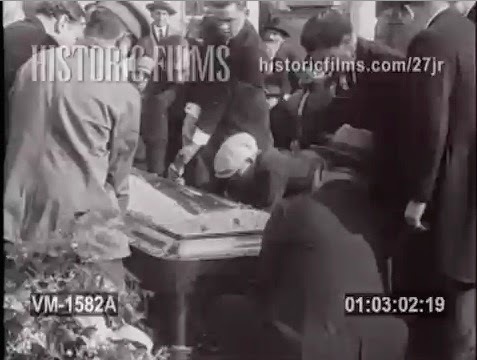 This image comes from a 1 second clip of film that shows Houdini's casket being lowered into the ground at Machpelah Cemetery on November 4, 1926. This is the last glimpse of Houdini on earth, and that's pretty wild. Also note that the casket does not have its covering of flowers. Does that look like a glass top? Maybe. This comes from a collection of archival Houdini stock footage available at Historic Films that was recently discovered by our friend Perry from New Jersey. The collection includes footage at Houdini's graveside funeral service that I have not seen before. In fact, some of it will appear in HISTORY's Houdini miniseries (and there we are back on that). 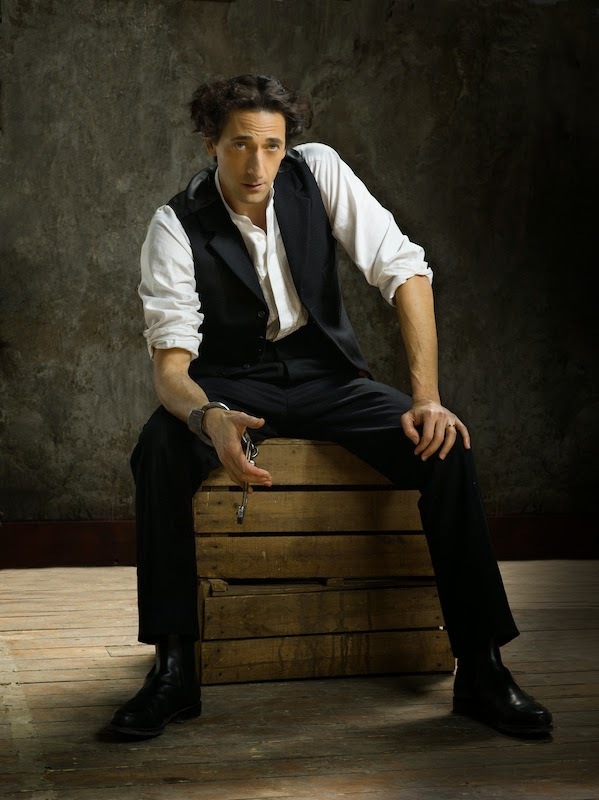 Here's an interview with actor Adrien Brody which aired on NBC's TODAY this morning. Brody's Houdini airs September 1 & 2 at 9/8c on HISTORY. "Edel's refreshingly dynamic direction and Brody’s buoyant performance allow Houdini's tricks to retain their wonder, even for the jaded modern viewer. That’s a magical feat indeed." My current plan is to post my own extensive review on Wednesday, September 3 after the two parts of the miniseries have aired. 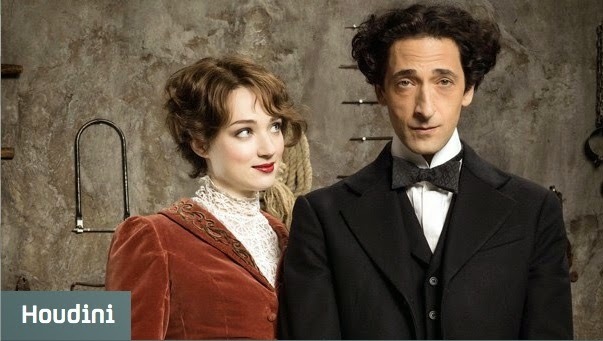 We only have one week left until HISTORY airs their two-part 4-hour Houdini miniseries starring Adrien Brody and Kristen Connolly. The network has been posting teaser images on their Facebook page, such as this one below. The official Houdini page at the HISTORY website has also launched a "Houdini Six Seconds To Escape Sweepstakes" featuring mini clips of famous Houdini feats from Houdini's point of view. I expect these mini films are what were shot on July 1st in New Jersey (remember this?). Houdini airs September 1 & 2 at 9/8c on HISTORY. It will be available on September 3 as an HD download on all digital platforms, including Amazon Instant Video, Netflix, and Apple TV. An extended version will be released on DVD and Blu-ray on Oct. 7. Yesterday was not only the big Potter & Potter Houdini auction, but it was also the day of the Great Escapes Houdini House Parities. This promotion for the upcoming Houdini miniseries invited people to host their own Houdini viewing parties. The party pack included a DVD of Night One, a poster, coasters, a Houdini cocktail shaker, a red carpet, and other nifty Houdini tie-in swag. Visit the Great Escapes Houdini Premiere House Party page to see photos of the various parties around the country, and also read some first reactions to Night One. 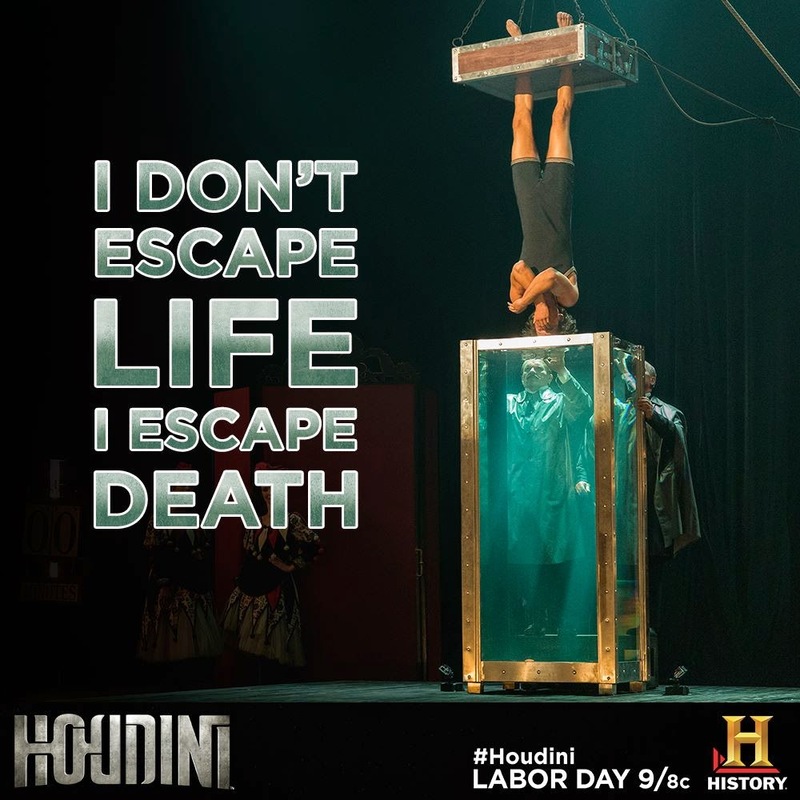 Houdini airs September 1 & 2 at 9/8c on HISTORY. 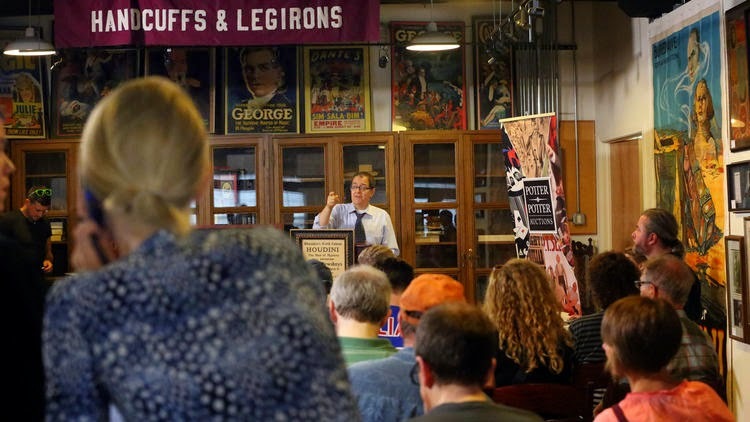 Great article in the Chicago Tribune about yesterday's big Potter & Potter auction. I think we may need to watch out for this young Harry Lowe. Kid sounds like a comer! Click here or on the headline to read the full article at The Chicago Tribune (looks like it allows one read, but more than that requires a subscription). Potter & Potter's massive auction of Houdiniana has just concluded in Chicago, and it was every bit the mega event that it promised to be! Here's a quick rundown of a few choice items. As expected, the Double Fold Death Defying Mystery box was the star of the show. The custom made chest beat its estimate of $20,000 - $25,000 to top out at $55,000 (before 23% buyers premium). I think that is a very good price for both the seller and buyer. And before anyone asks, I do not know if the buyer was David Copperfield, although I hope that it was. 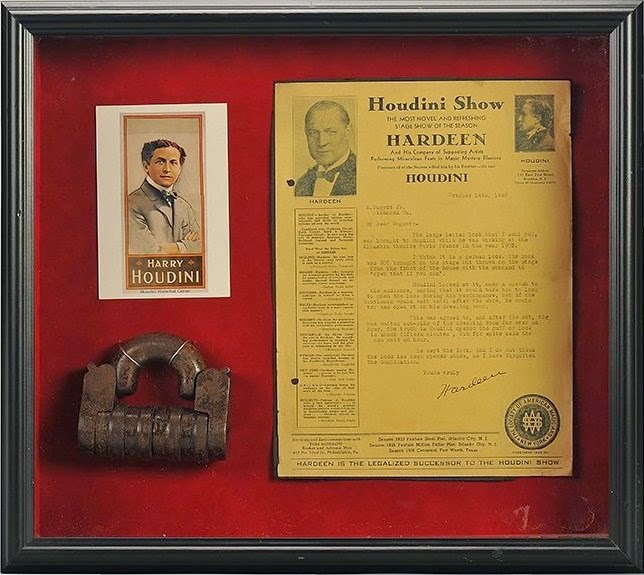 I think his International Museum and Library of the Conjuring Arts in Las Vegas would be the perfect home for this important Houdini artifact. I'm thrilled to say the second highest selling item in the auction was the lost spiritualism scrapbook that WILD ABOUT HARRY had a major hand in helping uncover last year. The scrapbook blasted past its auction estimate of $15,000 - $20,000 and topped out at $36,000 (before premium). A very big congratulations to our friend Mike! The Cologne Papers fell within their estimate and fetched a very respectable $26,000. Possibly what held it back from going even higher was the fact that the papers are mostly in German and the buyer will have to incur the expense of having these translated to discover what secrets they may hold. Let's hope that happens. 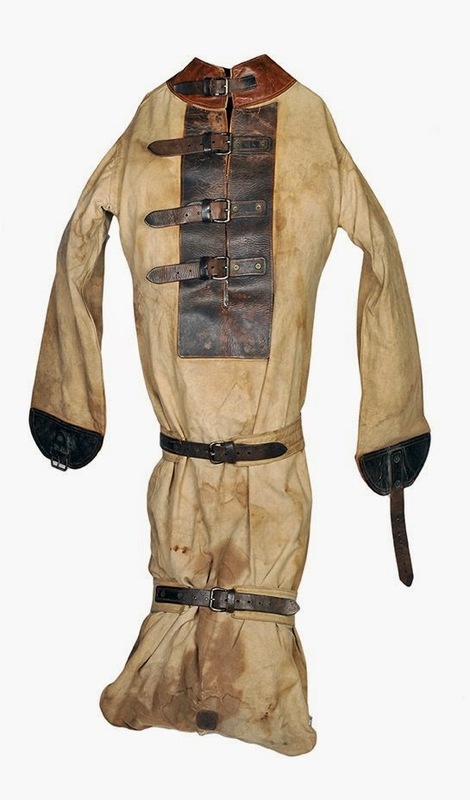 Houdini's sweat-stained punishment suit took in $11,000. I think that number could have been higher if we knew those stains belonged to Houdini and Hardeen instead if Sidney Radner, who used the suit extensively in his own performances as Render the Escape Artist (he also memorably escaped from it in the 1971 BBC documentary The Truth About Houdini). And speaking of Sid and Hardeen, the lot of 64 letters of their correspondence sold for $7,500. 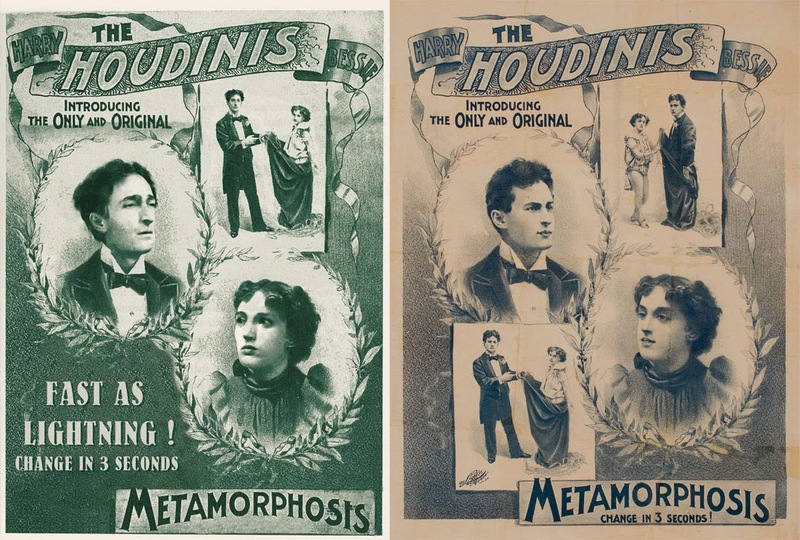 The Houdini/Morritt plans for the Black and White illusion conjured $10,000. 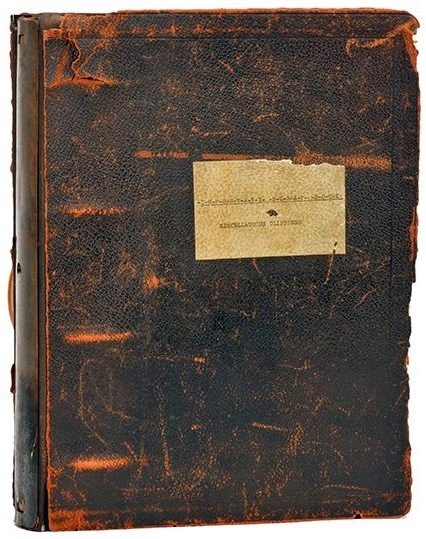 The unfurnished manuscript to Houdini's last book Witchcraft came in at $15,000. 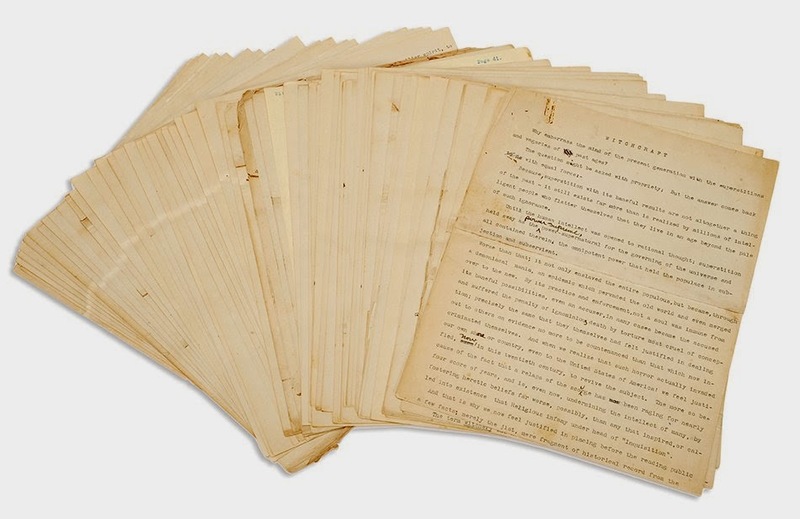 Houdini's heavily corrected revised manuscript for A Magician Among the Spirits grabbed $16,000. Bessie's tailcoat took $9,500 (estimate $7,000 – $9,000). An early Houdini bust grabbed $10,000. 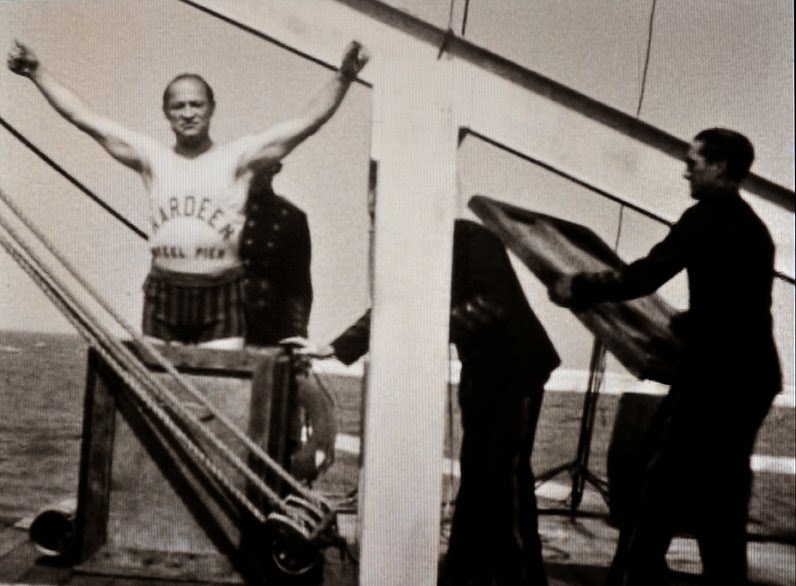 The 16mm film of Hardeen doing the overboard box escape in Atlantic City fetched $1,300. Even though this blew away the estimate of $300 - $400, I still feel like it's a deal considering this film has never been shown before. (Overall, it seemed the best deals were on Hardeen and Bessie items). What might have been the biggest surprise of the auction was a single combination padlock with an terrific letter of provenance from Hardeen that took away $16,000 (estimates was $7000 - $9000). Another surprise was a photo of Houdini leaping from a ferry that was estimated at $800 - $1000, but made a splash with $4,200. Speaking of photos, the image of Houdini in Russia grabbed $1,400, and the candid pic from Bess's birthday party inside 278 fetched $4000. Posters came in mixed. A 1905 German Art Nouveau poster found a buyer at $8,500, falling within its estimate of $8000 - $12,000 (but I thought it might do better). Buried Alive, which might be the only Houdini item in existence that seems to be decreasing in value, grabbed $8000 (estimate was $8000 - $12,000). But a King of Cards poster did unusually well at $17,000. Like Buried Alive, King of Cards has had trouble breaking above $10,000, but not today. It could be because this was the exact poster that magician Tommy Windsor used to create the first popular King of Cards reproduction in the 1950s. The only pass in the auction (that I witnessed) was the large Europe's Eclipsing Sensation advertising board. Ironically, this is the item that graced the cover of the auction catalog. It had a whopping $25,000 - $35,000 estimate with a $15,000 opening bid; even higher than the Double Fold box! Congrats to all the buyers and sellers and to Gabe Fajuri at Potter & Potter Auctions. This will go down as one to remember! The lost Houdini spiritualism scrapbook that WILD ABOUT HARRY had a role in uncovering last year has just sold for a whopping $36,000 (not including buyers premium). So far it is the second highest selling item in Potter and Potter's sale of Houdiniana happening right now in Chicago. CLICK HERE to revisit the story of how our friend Mike, a Southern California antique dealer, discovered this amazing Houdini artifact and how I was the first Houdini nut to get a look at it. As expected, the highest price (so far) went to Houdini's Double Fold Death Defying Mystery chest which came in at $55,000 (not including buyers premium). I'll have more auction results later today. 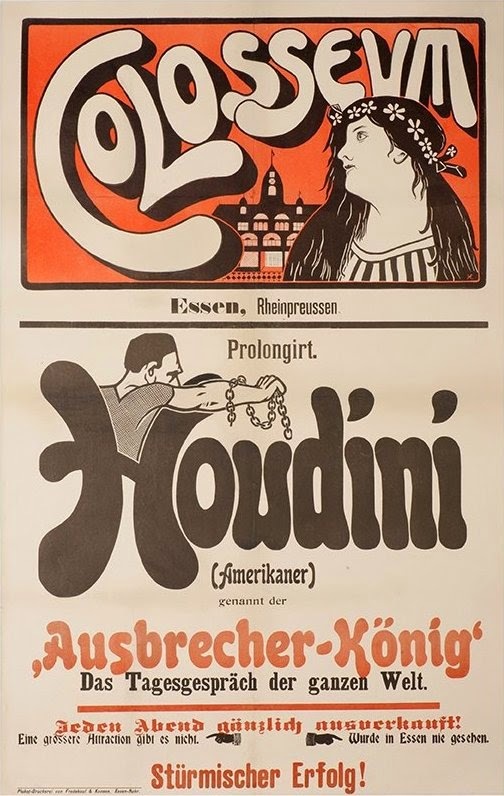 Patrick Culliton states: "Thanks to the notes Houdini took down (on Magician's Club stationary) as Morritt described "The Black and White" illusion, we finally know more about this lost masterpiece. 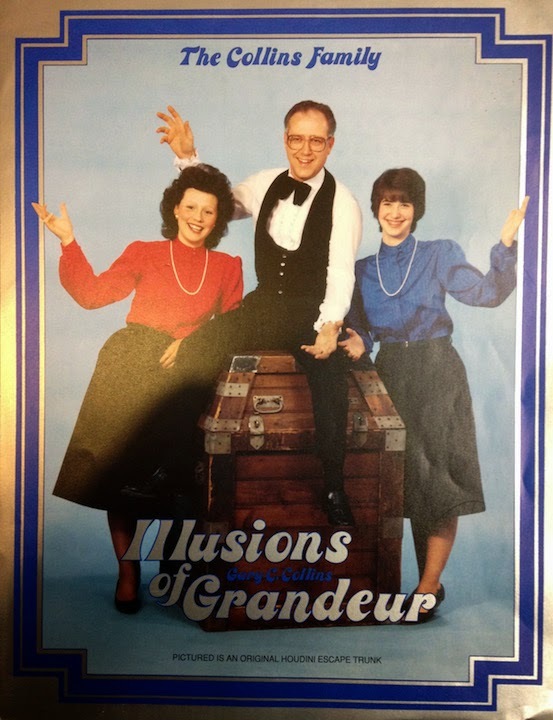 The last anyone heard of this illusion, Hardeen had it up for sale in a 1945 Conjurers Magazine. Then he died. He'd performed it at least once on an SAM show. 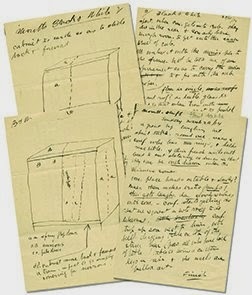 Houdini's notes, his handwriting, his drawing. A lost Morritt secret. This four page explanation with a Houdini drawing is Magic History gold." Lot 53: Important archive of 64 letters from Theo Hardeen. Important archive of 64 letters from Theo Hardeen to Sidney Radner. Spanning 1936 – 1945, and covering a wide range of topics, most importantly the various props, escape devices, handcuffs, locks, and Houdiniana Radner purchased from Hardeen. Hardeen explains the working of various articles, and also describes many of the escape devices and handcuffs sold to Radner over the course of their relationship. These included many of Houdini’s most famous escapes: The Water Torture Cell (in the correspondence, Hardeen refers to it repeatedly as the “U.S.D.” – short for “Upside Down,” as both he and Houdini called it), and the Mail Bag, as well as a handcuff cabinet, the Iron Man [Iron Maiden escape], and various pieces of Houdini memorabilia and photos, leg irons, keys, lockpicks, handcuffs. In one letter, Hardeen offers to sell Robert-Houdin’s trapeze automaton, Antonio Diavolo (referred to incorrectly as “Pyshio”). Many of Hardeen’s notes are tantalizing: “…I am sending you a three sheet litho of the Chinese Water Torture Cell…” In one letter, Hardeen alludes to the fact that the “trap and irons” for Houdini’s famous illusion of Walking Through a Brick Wall will probably have to be thrown away, as that portion of the apparatus is simply too big and bulky to ship. In another he writes, “I saw Houdini’s Milk Can today and it is a beaut.” Several letters specifically list items Hardeen is selling to Radner, with asking prices (two punishment suits and two straitjackets for $25.00, for example). Others include Hardeen’s take on current affairs, including the biography of Houdini by Harold Kellock (“This book is full of lies, and I am writing a book with a lot of “quotes” and correcting them.”). Letters are written on a variety of Hardeen’s letterheads, most being 4to sheets, and most accompanied by original mailing covers, hand addressed by Hardeen to Radner. Length varies from short notes to three pages. Several holographic letters on hotel stationery, written en route, are part of the archive. In the first letter, dating to 1936, Hardeen addresses Radner quite formally. In the last letter in the archive, Elsie Hardeen writes to Radner as a close friend, just after her husband’s death, in a familiar and friendly tone. Most letters are signed with Hardeen’s nickname “Dash,” which was given to him by his mother, as is explained in one of the letters. 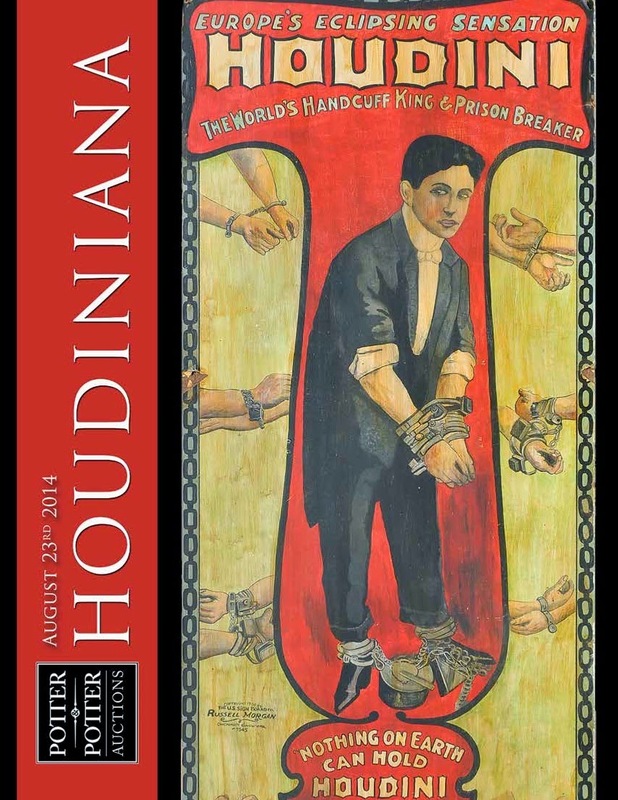 A remarkable and significant archive, and essential to the understanding of Houdini, his brother, and the lasting fame of the Houdini name. I would love to read and study these letters. I feel like the story of Sidney Radner and Hardeen is an untold and even misunderstood story of magic. I expect that story is all right here. Lot 81: 16mm film of Hardeen’s overboard packing box escape. 16mm film of Hardeen’s overboard packing box escape. Short silent film of Hardeen escaping from a wooden crate after he has been nailed inside and the box has been sunken under water. Likely a later print. With a digital transfer of the original, on DVD. Originally in the collection of Dr. Morris N. Young. Film of Hardeen doing the overboard box escape! How did we not know about this until now? Candid Photograph of Houdini and Bess in Russia with Houdini’s notations. July, 1903. 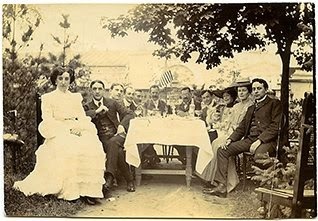 Houdini sits at a table with his wife and others in a garden, the American flag in the background. Holographic notes on the verso in his hand read, “Moscow Russia July 4 – 1903/Celebrating with American Consul in Russia.” Below Houdini’s writing is the penciled statement, “Property of B. Ernst.” 5 x 3 ½”. Old tear repaired with tape. What I especially love about this photo is that Houdini talked about this July 4th celebration in his Dramatic Mirror column. Read: The Handcuff King's blog: Breaking into Russia. Candid photograph of Beatrice Houdini’s 35th Birthday Party. New York, 1910. Taken in the Houdini home at 278 W. 113th St., New York. 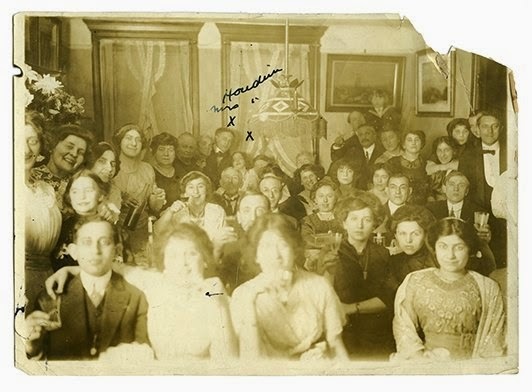 Family and friends fill the image, including Mrs. C. Weiss, Mrs. Rahner (Bess’s mother), Houdini, Bess, Theo & Elsie Hardeen, and other members of the Weiss family. On the verso, in Theo Hardeen’s hand, each person is identified by name. Houdini has marked himself on and his wife with the letter “X” on the photo, and signed his name above his image. 7 x 5”. One corner damaged, wear and chips at margins. Harry, Bess, Mama, Hardeen, and a great look at the inside of 278... Magnificent! And there is still so much more, but we are all out of time. You can view and bid on all the items in the Potter & Potter auction now at Live Auctioneers. The auction itself starts tomorrow at 8AM PT. In an interview with Backstage.com, actor Adrian Brody revealed something distressing about HISTORY's upcoming Houdini miniseries. It will reveal secrets. "There is an oath not to reveal certain tricks. And I had issues with this," Brody admits. "But the audience will gain an understanding of how some great illusions worked. You could probably find them online these days. I feel like it's an interesting facet of the storytelling, but I don't really like that certain things are revealed because he wouldn’t have wanted to reveal them." 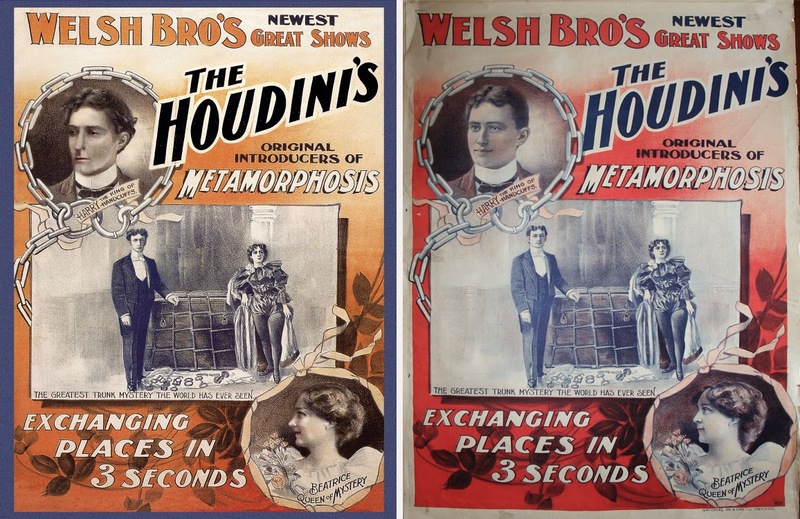 To what extent will Houdini expose the great magician's feats? For that I guess we will need to wait until September 1st. Houdini co-stars Kristen Connolly and Evan Jones. The 4-hour miniseries airs September 1 & 2 at 9/8c on HISTORY. An extended edition DVD will be released on October 7. Here's another incredible item from Potter & Potter's auction of Houdiniana set for this Saturday, August 23. This is the unfinished manuscript for a book called Witchcraft that Houdini was apparently working on at the time of his death. While I knew about The Cancer of Superstition, Houdini's collaboration with H.P. Lovecraft, this is the first I've ever heard of Witchcraft. Here's the auction description. Lot 67: Houdini, Harry. Witchcraft. An unpublished manuscript by Houdini. [New York? ], 1926. Detailed and important typescript with a profusion of holographic corrections and additions in Houdini’s hand throughout. The subject covered is, broadly stated, witchcraft. Houdini examines the entire subject, and gives a thumbnail sketch of its history, drawing and quoting heavily from published sources. More specifically, near the end of the manuscript Houdini writes in detail about the Witch of Endor, a medium in ancient times who was reportedly able to summon the spirit of Samuel at the command of King Saul of the Kingdom of Israel. In much the same way Houdini crusaded against spiritualists in his 1924 book A Magician Among the Spirits (several subjects from which appear in passing in these pages), so does this manuscript demonstrate his unwavering crusade against pillars of the spiritualist faith, which so often used Bible stories as support for its cause. A total of 62 numbered pages on 4to sheets, typed on rectos only, some significantly larger after cutting-and-pasting. The professional tone suggests a guiding editorial hand, while the hundreds of corrections in Houdini’s hand show his tendency toward misspellings and awkward phrases. Some corrections are in pencil or red pencil. A copy of an unsigned letter regarding Houdini’s work on the manuscript, dated July 16, 1926, is included, and shows that this was one of the last publishing projects he was working on before his death. Accompanied by a letter of provenance tracing the ownership of the manuscript. Wouldn't it be wonderful if the winner of this manuscript saw fit to have it published? You can view and bid on all the items in the Potter & Potter auction now at Live Auctioneers. You can also purchase the auction catalog or download a free PDF from the Potter & Potter website. 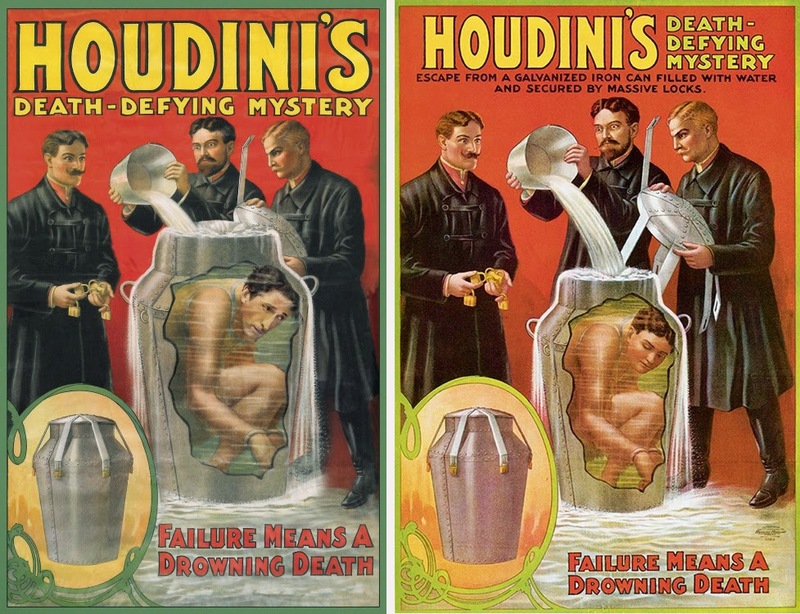 Among the big Houdini news this month has been the reappearance of the custom made box Houdini used in his famous Double Fold Death Defying Mystery (which was an enhanced version of his Milk Can escape). That box will be going up for auction as part of Potter & Potter's massive sale of Houdiniana set for this Saturday, August 23. "My wife and I traveled for 30 years performing in churches across the U.S. I started in '71, sold my house, bought an Airstream trailer and van to pull it. As we acquired more equipment out tow vehicles got larger. 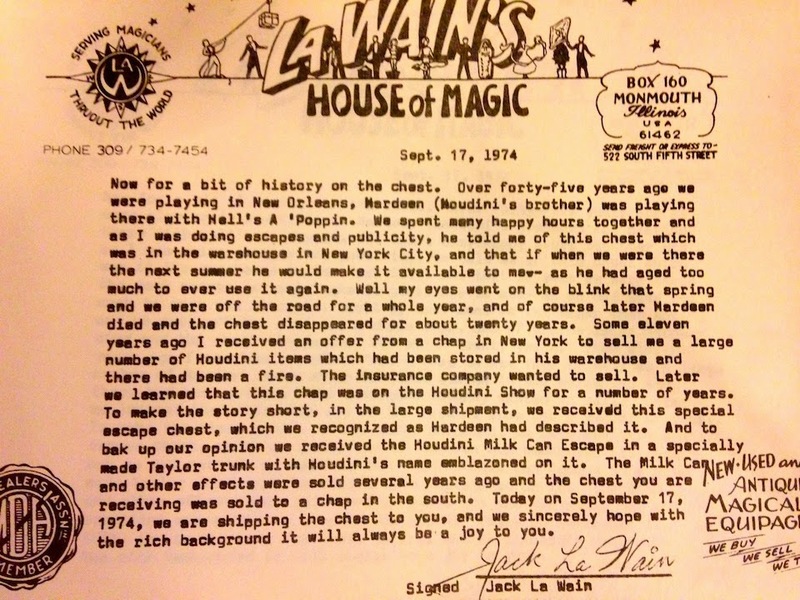 Wendy and I were married in August of '74 and in Sept I received a list of used magic from. LaWain's House of Magic. On the list was a trunk that he said was Houdini's. I wrote and asked if it was real and he said it was so I bought it. We would be in a church from Sunday through Wed/Thur. We would display the trunk and mention that I would be escaping from it one of the nights during the week. I asked them to bring padlocks. I would get in the trunk and be handcuffed or have stocks put on my wrists or both, it changed over the years. Wendy and our daughter would put the top on, lock the hasps, have the people put their padlocks on. We would say that I would escape in 60 seconds. If possible I would do a run a round to the back of the church. I would not be out in 60 seconds, so Wendy would have the people get their padlocks off, open the lid and I would run in from the back. It was fun and the people enjoyed it. Thousands of people saw it over the years. You mentioned that it was rumored that the trunk existed but nobody knew where it was. Because I performed in churches, never at a convention, never wrote a book or lectured, to the magic community, I didn't exist. We stopped traveling in 2000 and now I am in the process of selling all of my equipment. [...] Since we used the box for 30 years, I am assuming we used it more that Houdini and Hardeen combined. We just never had the water can. But we got a lot of enjoyment out of it and the people had fun." 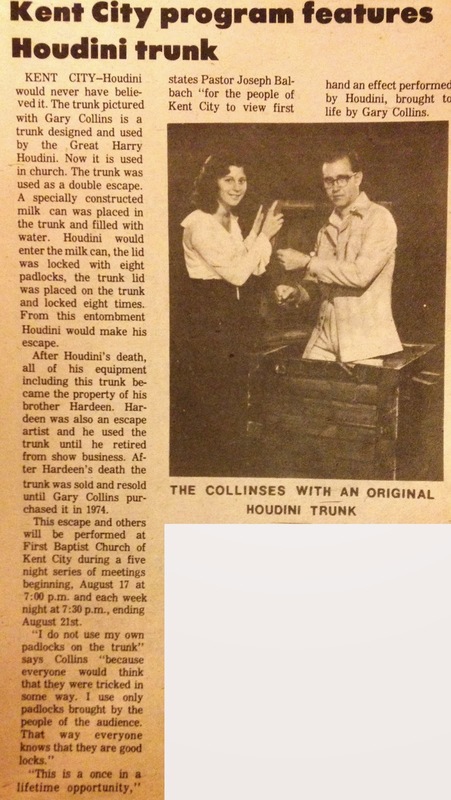 Below is a terrific clipping Gary sent me about one of his many appearances with Houdini's Double Fold box. Below that is a letter from the previous owner, Jack La Wain, explaining how he came into possession of the famous prop. A very big thank you to Gary Collins for sharing his story with us. While I doubt the next owner will be performing the escape, let's hope they will enjoy and cherish it as much as the Collins family. You can see the Double Fold Death Defying Mystery box for yourself starting TODAY at Potter & Potter's auction exhibition preview at 3759 N. Ravenswood Ave., Suite 121, Chicago, IL 60613. You can view and bid on all the items in the Potter & Potter auction now at Live Auctioneers. Lionsgate has announced the details of their Houdini Home Entertainment releases. The miniseries will first be made available on September 3 as an HD digital download on all digital platforms, including Amazon Instant Video, Netflix, and Apple TV. This is especially good news to those who don't have cable and won't be able to see it when it premieres on HISTORY September 1 & 2. 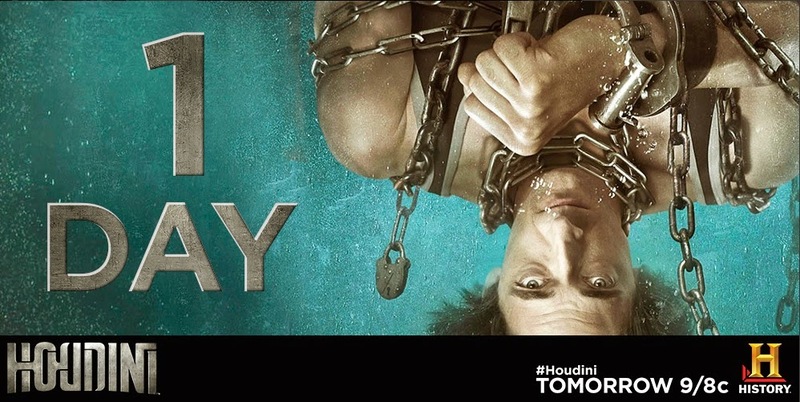 SANTA MONICA, CA (August 18, 2014) – Following HISTORY®’s broadcast airing of the larger-than-life miniseries event on September 1st and 2nd, Houdini will be available on Digital HD the following day on September 3rd. Then, unveil even more of the secrets behind the greatest magician of all time in the extended version of Houdini on two-disc Blu-ray (plus Digital HD) and two-disc DVD (plus Digital) October 7 from Lionsgate Home Entertainment. Boasting an all-star cast including Academy Award® winner Adrien Brody (Best Actor in a Leading Role, The Pianist, 2002) as The Great Harry Houdini, Kristen Connolly (Netflix’s House of Cards) and Evan Jones (Gangster Squad), the scripted four-hour event chronicles Houdini’s extraordinary life as he finds fame while defying death with his incredible stunts and illusions. His ability to escape from handcuffs, strait-jackets and water tanks is legendary - breaking the shackles of his past proved more challenging. HISTORY®’s Houdini follows the world-renowned master of escape’s transformation from immigrant into the world’s first superstar. Driven, disciplined and actively chasing the American Dream, Houdini constantly pushed his physical limits to accomplish feats of strength that amazed audiences in an age of spectacle. And though they saw what he wanted them to see, his reality was more elusive than his escapes. The Houdini two-disc Blu-ray and two-disc DVD feature both the original HISTORY® televised version as well as a brand-new extended edition with over 20 minutes of additional film footage of the captivating series. 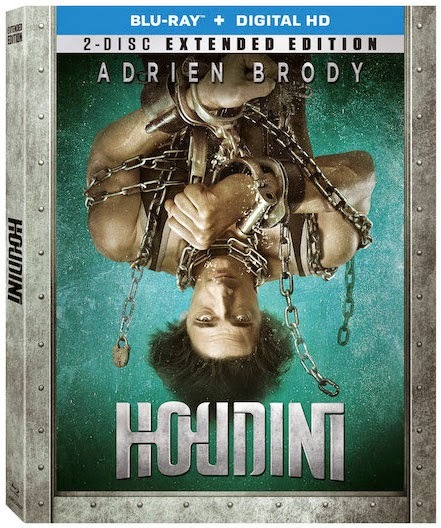 The Houdini Blu-ray and DVD also include four behind-the-scenes featurettes and will be available for the suggested retail price of $29.99 and $26.98, respectively. Title Copyright: Houdini © 2014 Lions Gate Television, Inc. and A&E Television Networks, LLC. All Rights Reserved. Artwork & Supplementary Materials © 2014 Lions Gate Entertainment Inc. and A&E Television Networks, LLC. All Rights Reserved. The soundtrack to HISTORY's Houdini miniseries is now available for pre-order on Amazon. The soundtrack by John Debney comes on two volumes (one for each night) and will be available as an MP3 on August 26 and on CD September 30. The MP3 pages offer previews all the tracks of Debney's highly electronic score. 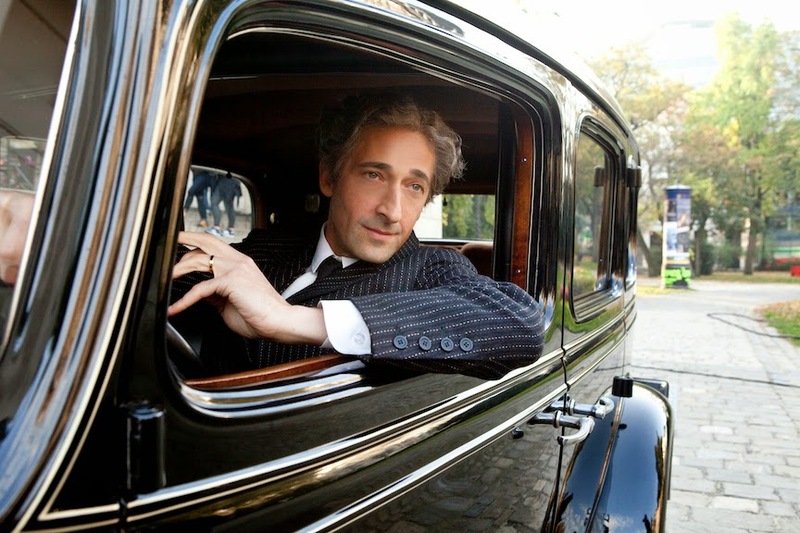 Houdini stars Adrien Brody and Kristen Connolly. The 4-hour miniseries premiers September 1 at 9/8c on HISTORY. Watch the trailer here. 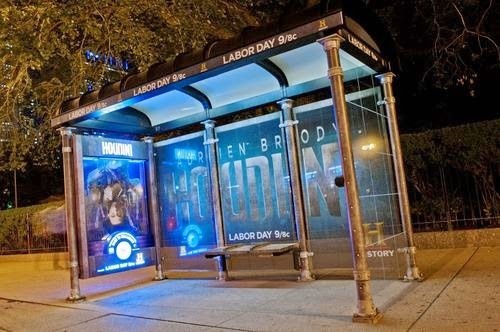 Bus stop ads have begun to appear for HISTORY's Houdini miniseries, and some come with a highly original twist! 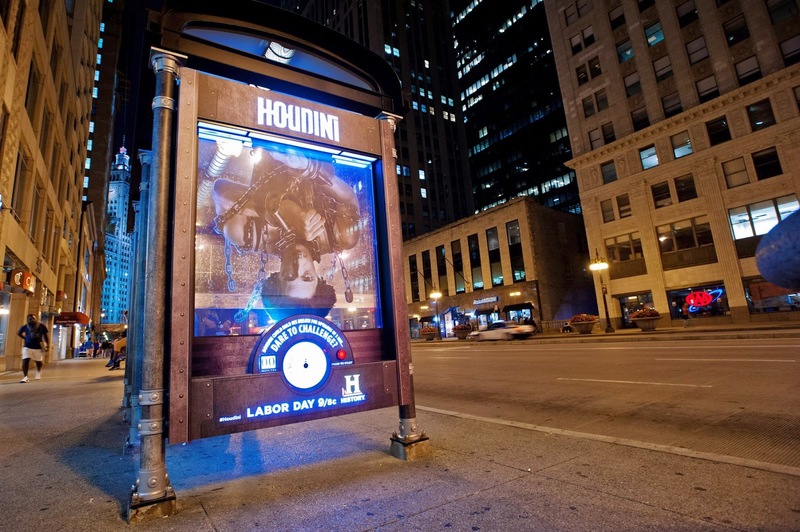 The photos below from Red Eye Chicago shows an ad in Chicago that fills with water as you test your ability to hold your breath as long as Houdini. And if any of you are tut-tutting about this being a vulgar publicity trick, remember that Houdini once hired seven bald men to sit on a city street, and as pedestrians would pass by they'd remove their hats and bow their heads to reveal: H-O-U-D-I-N-I. Houdini premiers September 1 at 9/8c.